It is always a pleasure to read a fantasy novel that steps outside the parameters of the usual formulae. 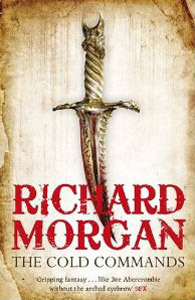 It is no surprise that Richard Morgan is also an accomplished, award winning Science Fiction author. He has the inventive ability to take the mundane and layer it with complexity in order to produce an exciting story.Â The Cold Commands is a sequel to The Steel Remains in that it is set in the same world and involves the same characters. The three main characters, Ringil, Archeth and Egar, come from different backgrounds and are unlikely friends but each would trust the others to watch their backs. They are survivors. At the start of this novel Ringil is pursuing his own agenda. He is the disgraced scion of a noble house and a sorcerer (his crime is to prefer men to women for his pleasure). He leads a band of mercenaries that are attacking slave trains and killing the slave masters. What happens to the freed slaves is something he has no power over but the needless subjugation of others is something he abhors. The latest attack results in the death of an imperial legate and Ringil catching a cold which makes him vulnerable to his enemies. Egar finds trouble in different ways. He is a rampant womaniser and is conducting an affair with the wife of an imperial commander. While her husband is at home he finds himself following up a dispute between two men hailing from his part of the world, discovering that the Citadel, the stronghold of the religious faction of the State, is hiring his countrymen as guards. Investigating starts a series of events that puts a price on his head but, unlike Ringil, everyone knows who they are looking for. The third member of this unlikely trio of comrades is Archeth. She is the last known member of an ancient race that has always provided the Emperor with an Advisor. She in turn is advised by an entity known as a Helmsman. If this book was promoted as science fiction then a helmsman would be recognised as an Artificial Intelligence but on this low tech world it is a magical and mysterious being. Archeth is sent to collect a Helmsman that appears to have fallen from the sky. This entity warns of dire things heading their way. Mixed up in this are the Dwenda, a race of sorcerers who everyone hopes have been defeated but who keep turning up to make life difficult for our heroes. Morgan writes about complex characters and sets them in a complex setting surrounded by an intriguing plot in such a way that it is difficult to do justice to it within a review. Although ostensibly a fantasy world it is a long way from the neat, wish-fulfilment novels that are churned out by some writers. This is a nasty, gritty and brutal world. All the main characters have issues that follow them and colour their actions. They have histories and have done unpleasant things which were necessary at the time. They are all efficient killers, surviving in a world that is against so many of its citizens. Often their actions are not nice or guided by high morals but then Morgan has created a world that should not be judged by current standards of humanity. All the time there are hints of darker things to come and clues that this is not what it seems.Â I look forward to the next volume.